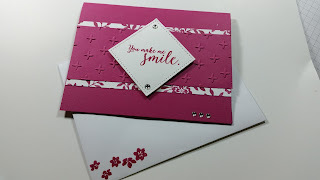 You Make me Smile featuring Stampin' Up! "Colorful Season". 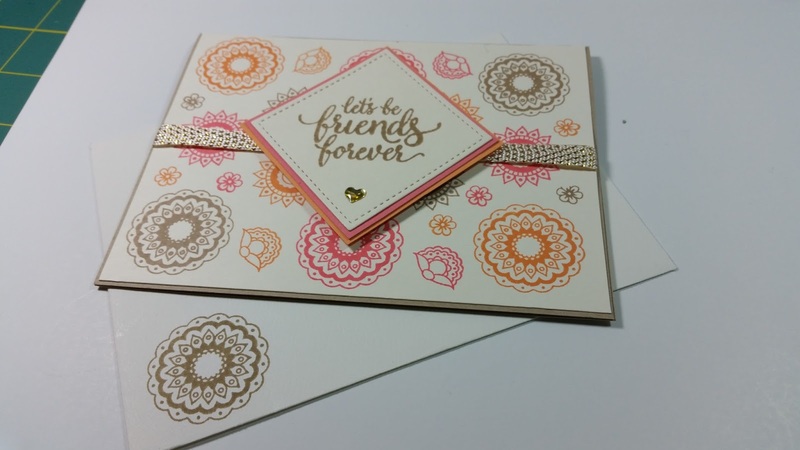 The inspiration for this design came from our team's weekly challenge "embossing". This was a quick and easy card. I really liked how the embossed layer enhanced this card. Cut whisper white cardstock 4" x 4"
Use the bigshot to emboss the berry burst 5 1/2" x 2 1/8", with the sparkle embossing folder. 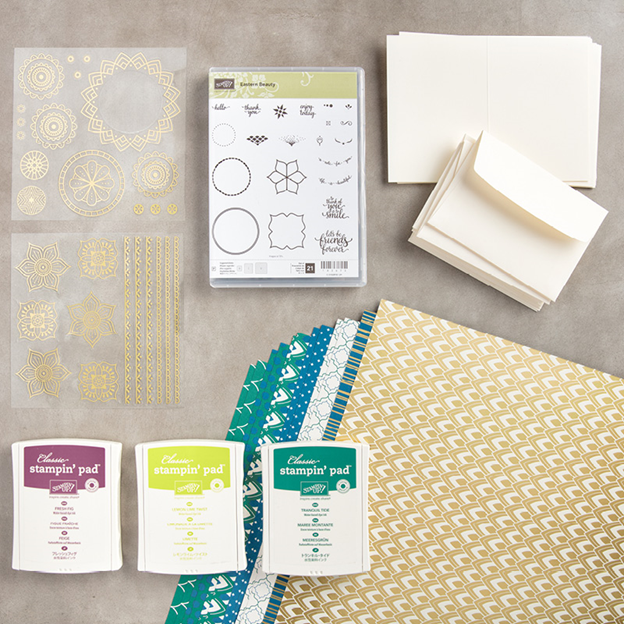 Use the stitched square shaped thinlet die to cut the whisper white cardstock. Stamp sentiment on stitched square shape using the colorful season stamp set and the berry burst ink pad. Pick an image from the same stamp set and create a matching envelope. Use snail adhesive to attach the dsp to the card base. Use fast fuse to attach the embossed layer to the card base. 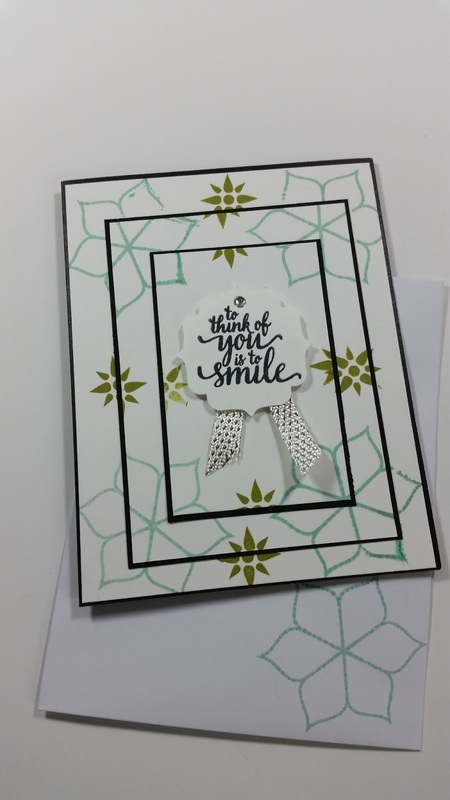 Use dimensionals to attach square shaped sentiment embellishment to top of card. Add metallic enamels to card for that extra bling. 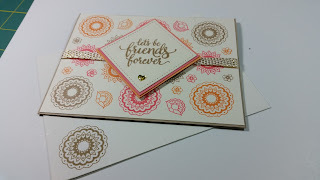 Triple Stamping featuring Stampin Up "Eastern Beauty"
This is my take on a card I CASEd from "Do Stamping with Dawn". I really like the effect the triple design gives my card. I decided to use this technique to feature the "Eastern Beauty" stamp set. This stamp set is from the Eastern Palace Suite. 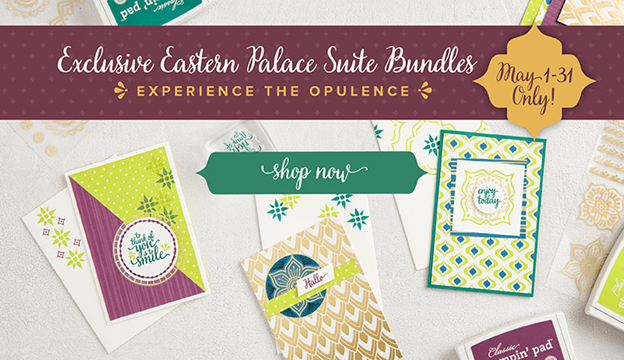 Stampin' Up is giving everyone the opportunity to purchase this bundle before the annual catalog is released June 1st. Check out all this great product. Use scrap pieces for sentiment embellishment. 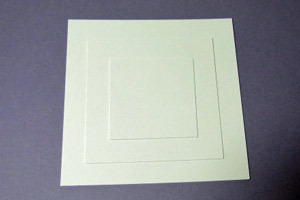 Place white cardstock as shown below. Stamp design using the Eastern Beauty Stamp set with pool party and pear pizzazz ink pad. 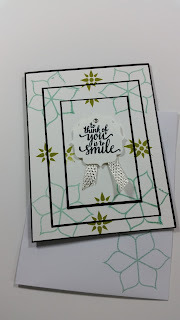 Stamp sentiment on whisper white cardstock scrap. Punch sentiment using pretty label punch. 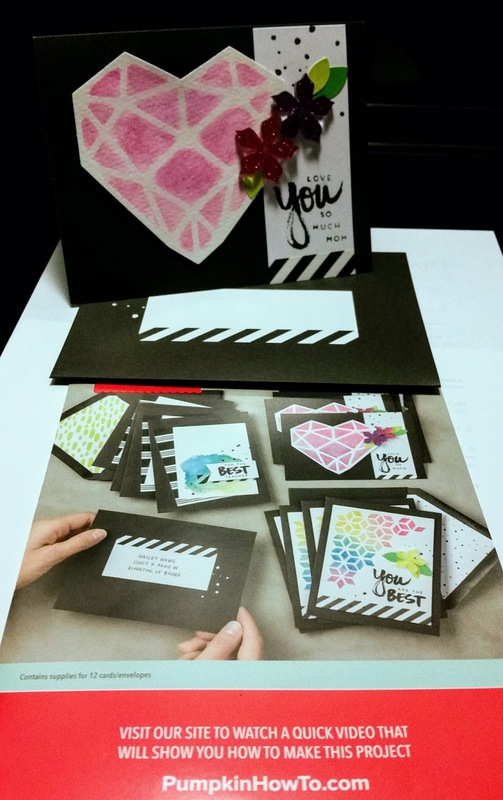 Attach 4" x 5-1/4" white cardstock to black card base with adhesive. Attach 3" x 4-1/4" white cardstock to black piece 3-1/4" x 4-1/2" with adhesive. Attach 2" x 3-1/4" white cardstock to black piece 2-1/4" x 3-1/2" with adhesive. Secure ribbon to the back of the sentiment layer and attach sentiment embellishment with dimensional to give your card an extra raised effect. 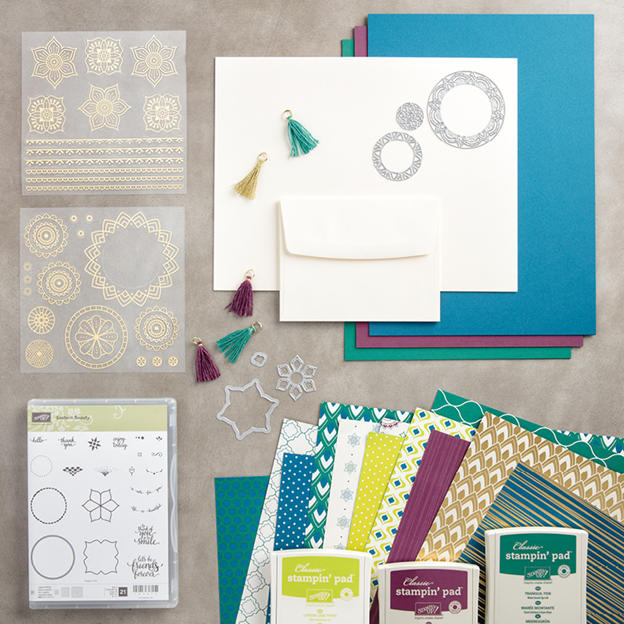 Add metallic enamel shapes to card for that extra pop! One of the great perks of being a Paper Pumpkin subscriber is the ability to use your left supplies and stamp set on other projects. Since I've been a subscriber making alternative projects with leftover supplies and the stamp set is one of my greatest joys. My inspiration for this card came from our team's weekly challenge " Something that Fly". I used the card base, envelope, and adhesive white cardstock from the kit. My something that fly came from Stampin' Up "Grateful Bunch" stamp set. Stamp whisper white cardstock with butterfly and lace images from the Grateful Bunch stamp set. 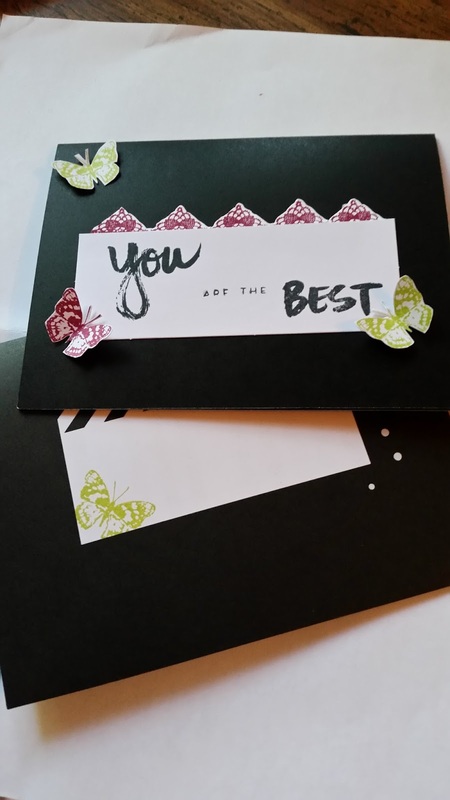 Stamp one edge of envelope label with butterfly image. 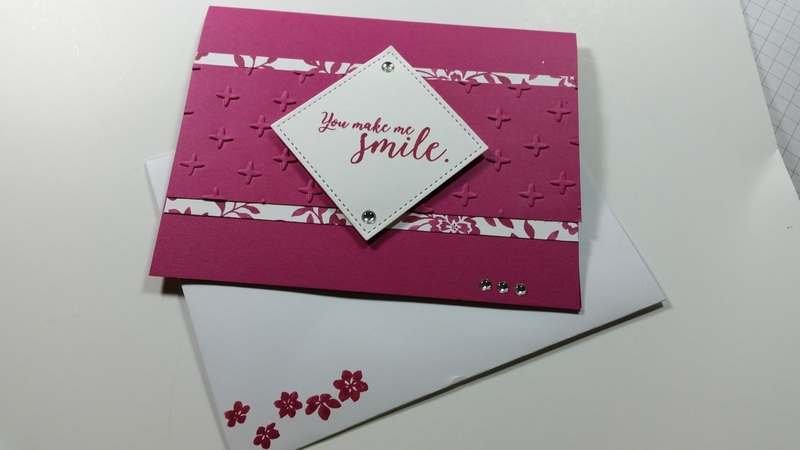 Stamp sentiment on whisper white adhesive cardstock. Hand cut three butterflies and lace image from whisper white card stock. Attach lace and butterfly embellishments with mini glue dots. Rhinestones can b e added to the butterflies to give your card a little bling. 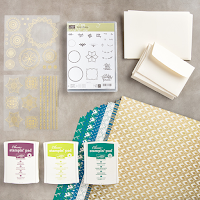 Want to craft but feel like you don't have the right supplies? You don't enough crafting space or enough crafting time. Does any of this sound familiar? Attention All New Customers to make sure you can have the full Paper Pumpkin experience, the Creativity Starts Here promotion runs May 11-June 10, 2017. In this promotion you will receive an introductory 25% discount off June, July and August kits. You will receive this bright orange box in your mail for $14.97 (shipping included) during this 3 month introductory promotion. To makes this super cute card and other alternatives from your Paper Pumpkin kit join my team. As a member of my team you will receive a monthly newsletter featuring, giveaways, team challenges, bonus projects pdf. I really enjoyed making this card. This card was my creation for our team's weekly color challenge. I used Paisley and Posies stamp set and Eastern Beauty stamp set to create this card. I decided to mix a little old with a little new. Card measurements: 5 1/2" x 4 1/4"
Cut crumb cake cardstock - 5 1/2"x 4 1/4", score@5 1/2"
Cut very vanilla cardstock - 4 3/8" x 5 3/8"
Create custom designer series paper (dsp) with Paisley and posies stamp set. Use each ink pad to get your desired background. Stamp sentiment on stitched square using eastern beauty stamp set. Use snail adhesive to attach ribbon to (dsp) layer. Add more adhesive to (dsp) layer and attach it to card base. Use mini glue dots to create three layer square. Use 3 dimensionals to attach sentiment embellishment. Give the card that extra pizzazz with a metallic gold enamel shape. 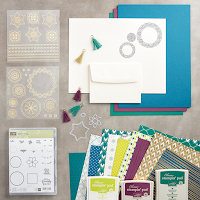 Join the fun to create your own paper treasure! I CASEd this super cute from one of the swaps I received from the Shreveport OnStage last month. The swap was created by Jennifer Evanko. I recently joined a card swapping group and I thought I would use this as my first swap. I really enjoyed get reacquainted with some of my the first punches I received after becoming a Stampin Up demonstrator. The sentiment came from the free stamp set in April 2016 Paper Pumpkin kit. Cut Pumpkin pie cardstock - 5 1/2 x 4 1/4", score @ 5 1/2"
Cut Festive Birthday Designer Series Paper - 4" x 4 3/4"
Cut emerald envy ribbon 8" long. Stamp whisper white cardstock 2" x 5" with flower image. Stamp whisper white cardstock 1" x 3" with sentiment. Use sponge dauber to distress edge of banner. Punch flower using Pansy punch. Create banner using the triple banner punch. 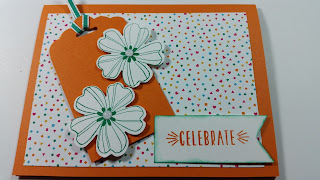 Use the scallop topper punch to create tag. Use snail adhesive to attach designer series paper (dsp) to card base. Attach ribbon to tag using a slip knot. 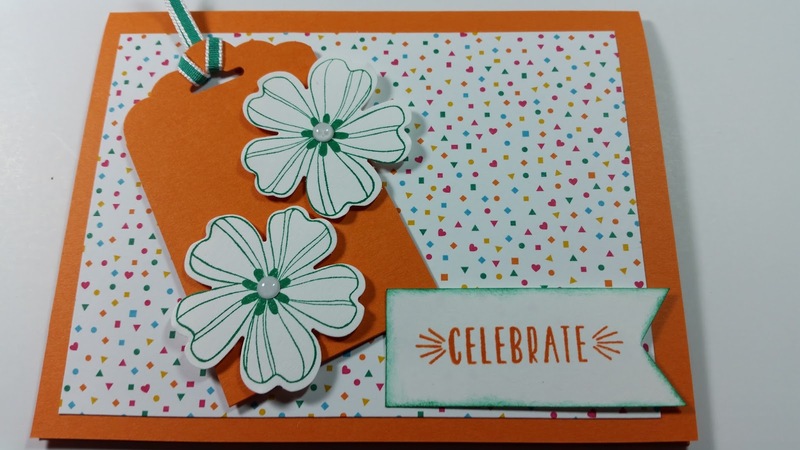 Attach tag and banner to card base with dimensionals and mini glue dots. Add white perfect accents to each flower center. Hooray your card is complete.